This chapter presents the application of robotic microsurgery with the example of a free groin flap to resolve recurrent problems at the donor site of a previous pedicled radial forearm flap to cover a defect on the dorsal hand. The discussion shows the particular aspects of this kind of surgery: the quality of 3D vision, the absence of haptic feedback and its implications and its consequences. 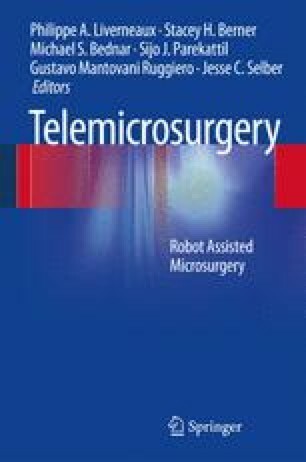 Other aspects such as the availability and the costs of the instrumentation are discussed, as well as the perspectives of the evolution of robot-assisted microsurgery (telemicrosurgery).